John Luce Lockett studied at The Byam Shaw, Kensington and The Northampton School of Art. 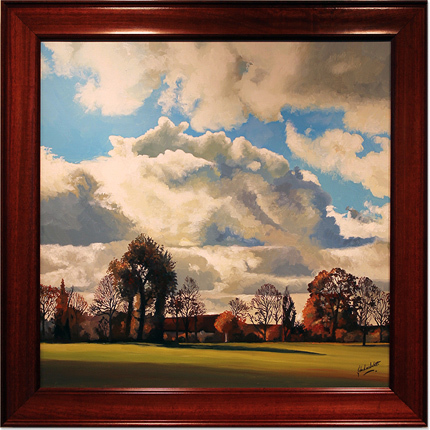 Although he has worked in a variety of media, including watercolour, he has always considered himself to be an oil painter. His colourful artistic career has led him to exhibit at The Royal Society of Portrait Painters, multiple London galleries; and to be internationally published for open and limited edition prints. Having studied life drawing and human anatomy John’s primary interest is painting people. He prefers to choose his own models, locations and compositions. His intention is to weave his own narrative, both real and imagined, within the captured characters and landscapes. His first one-man gallery show in London’s Cork Street was followed shortly by the opening of his own Northampton gallery in 1983. In 1995 John painted a collection of works (The White Collection) for London Contemporary Art (LCA). These paintings were exhibited at The Roy Miles Gallery, and The Albemarle Gallery, London and the New York, Los Angeles and Tokyo Expo's by LCA. His piece ‘Heaven’ was subsequently published by Wyatt Russell. In 1995 John gained national and international acclaim for his reconstruction portrait of Fletcher Christian, the Bounty mutineer. This is now the definitive portrait of Christian throughout the world, and is featured in the book, ‘Fragile Paradise’ by Glynn Christian. In 1999 John completed a collection of work called: ‘20th Century Romance,’ which was exhibited both in Northampton and London. Four paintings from this collection were published as limited edition prints. In the year 2000 John was again commissioned by London Contemporary Art to paint a collection of works entitled ‘NightHawks,’ which were internationally exhibited by West End Galleries, Florida and by LCA in both New York and Los Angeles. John currently exhibits at select galleries in the UK. His nudes are regularly featured on the Barebrush Calendar organised by artist and entrepreneur Ilene Skeen in Manhattan New York. Please note that all John Luce Lockett art listed in this section has previously been displayed for sale and is not currently available.